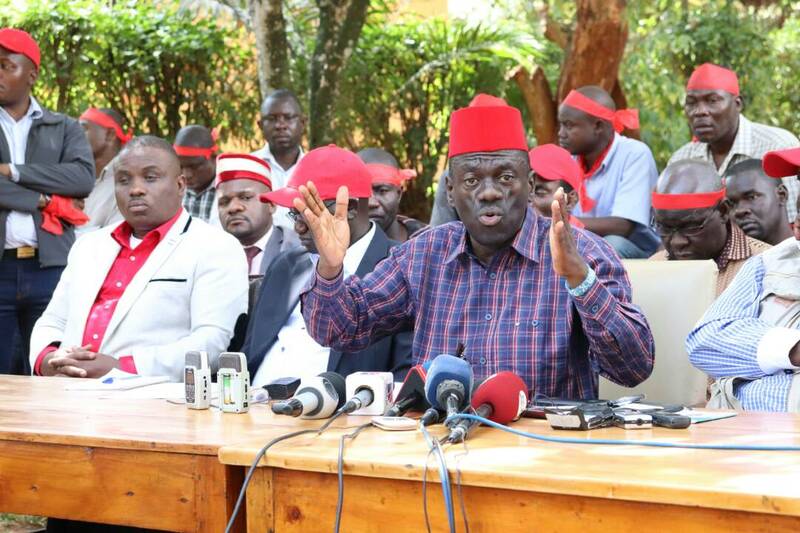 Former Forum for Democratic Change president Dr.Kizza Besigye has said that Ugandans have now been given a green light to do whatever it takes, including taking arms to restore their constitution. On Wednesday, parliament finally passed the contentious age limit bill to lift the lower and higher presidential age limits from the Constitution. 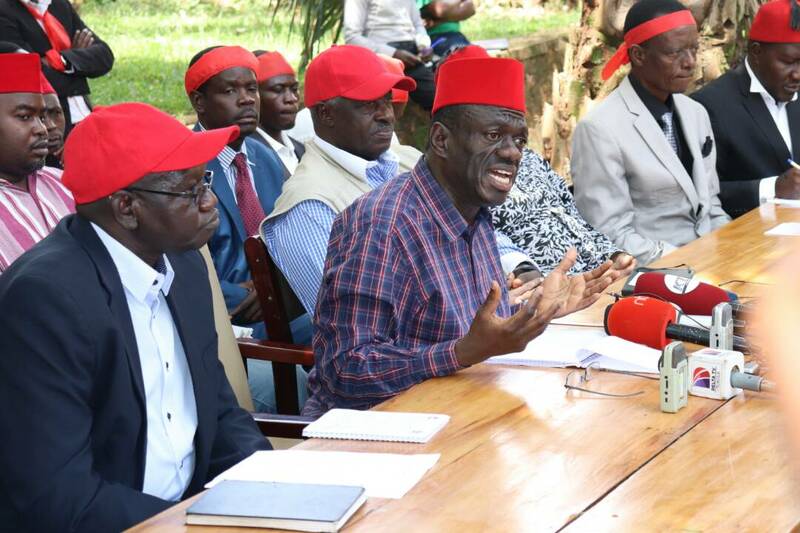 Adressing journalists at Katonga road in Kampala on Friday, Besigye said that Uganda is headed to dark times if nothing is not done to restore the Constitution that was overthrown by parliament. “Whoever resists the overthrow of the Constitution commits no offence. Even if it means taking guns, its in their power and allowed in the Constitution”Besigye said. Parliament on Wednesday on top of voting to lift the presidential age limit also voted to extend the term limit for all elected leaders from five to seven years. Besigye addresses a press conference at katonga road. The four time presidential candidate said that whoever participated in the act of changing the constitution committed treason, adding they ought to be fought by every peace loving Ugandan. Changing of article 102 (b) of the Constitution that focuses on age limit will now allow president Museveni stand again for the post of the highest office in the country. 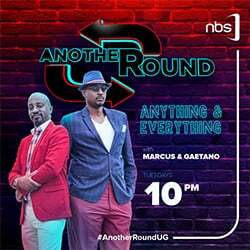 Museveni is currently 73 years old. Describing it as being a worthless document, Besigye said that it would be foolish for anyone to chest thump for reinstating term limits in the Ugandan constitution that he said has no value. Kampala Lord Mayor Erias Lukwago said that it is constitutionally right and legal for every person to use means at their dispose so as to restore the constitution. He described the actions of the Members of Parliament as being a fraud whose outcome cannot be allowed to continue . JEEMA president Asuman Basaalirwa urged that well wishers should seek legal intervention on the fate of legislators who voted to lift the age limit. “We should seek high court to declare that all MPs who went against the views of their voters be sent out of parliament ,”Basaalirwa said. Former Lubaga South MP Ken Lukyamuzi said it was absurd that the constitution was changed in a bid to benefit only one individual. Dr.Besigye revealed that they would start activities aimed at restoring the constitution that has been finally overthrown early next year. “Starting January 9th, we shall kick off our campaign to restore the constitution. We shall offer our leadership duty which is necessary to take forward the campaign, “Besigye said.